So for this week’s Style Crush, I’ve chosen the gorgeous Sophie Ellis Bextor. I spotted these images of her whilst flicking through a magazine at work the other day, and just knew I had to use them! Here she is at the opening of the Jacques Townhouse Pop Up Hotel, looking ever so chic in a lace dress and rocking a sleek beehive. The dress Sophie wears is from Topshop, but is now sold out – boo! Here is an alternative way of creating Sophie’s look. I searched high and low for a High Street alternative of the luggage Sophie is holding, but had no luck! Instead I have opted for s large holdall that I think compliments the look. Hope you like my version! Doesn’t she look gorgeous!? Please let me know who you would like to see next week! I love her dress! 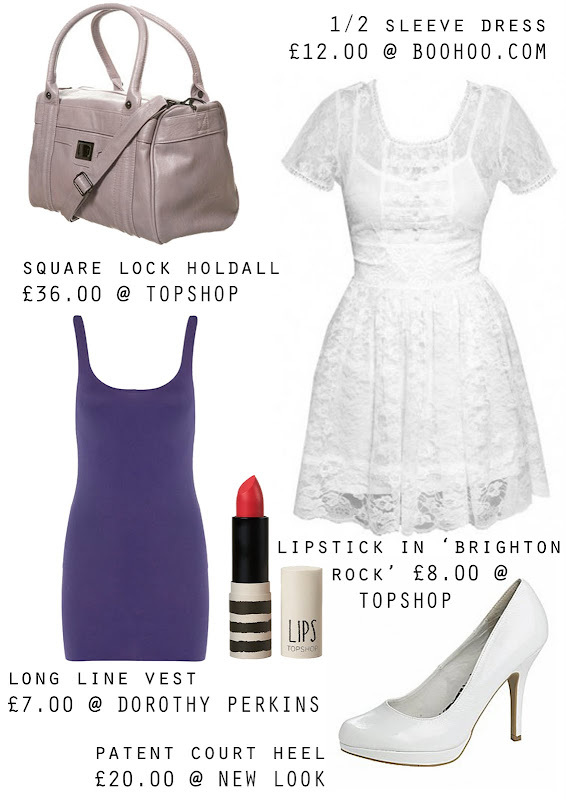 I think it's a Topshop one and costs around £60. And the luggage case is to die for. She is lovely. Good style crush Claire! She is impossibly beautiful, and very girlish. Sophie's dress is wonderfully pretty. I love the whole look.